Chasing Davies: The Sale! The Pieces! The Prices! The Sale! The Pieces! The Prices! You guys, I had to pop in to share, not on this great sale going on, but my favorite pieces (because ohhh my goodness) that you can now get for 25% off! Shopbop doesn't have a lot of sales - but when they do, I jump, bceause they are good and the brands and pieces they have on their site are top notch. Shop right now! Sale ends tonight at midnight PT! Use code: INTHEFAM25 Enter code at checkout. Some designers excluded (see all details here). Turtlenecks - like this sweater and dress, even! Because winter is coming and turtlenecks are BACK (I'm so excited). Gold jewelry and watches - because they never ever go out of style and you can wear all.year.around - and they also make perfect gifts (like this Triangle Earring Set & Leather Watch). Winter Gear - Like it or not, you'll most likely (depending on where you live or where you're running away to) need these boots and this coat, and at least you'll be warm AND look good being so. Classic Accessories - There will not be a day quality sunglasses and handbags go out of style or a day when you won't need them. I've stopped buying cheapo bags and limited to the number I own all together - keeping the ones that will last, like this one! Same goes for sunnies - and these ones are classic, yet unique enough to make a statement for years to come. Denim - Try out the wide leg trend for a discount or find your own perfect pair from a wide selection of quality brands! Vests - My very favorite trend for this season is the long vest! I have already been wearing the two I own on repeat, and thinking this gray one needs to be added to the collection. Vests are the perfect layering tool for now and later. Booties - What is the No. 1 thing you love most about Fall style? Mine is the bootie. I have a whole collection and I wear them all! Great time to stock up on a great pair, like these perfect ones, that will also be comfortable (whaaat?!?! You really can have.it.all). So! 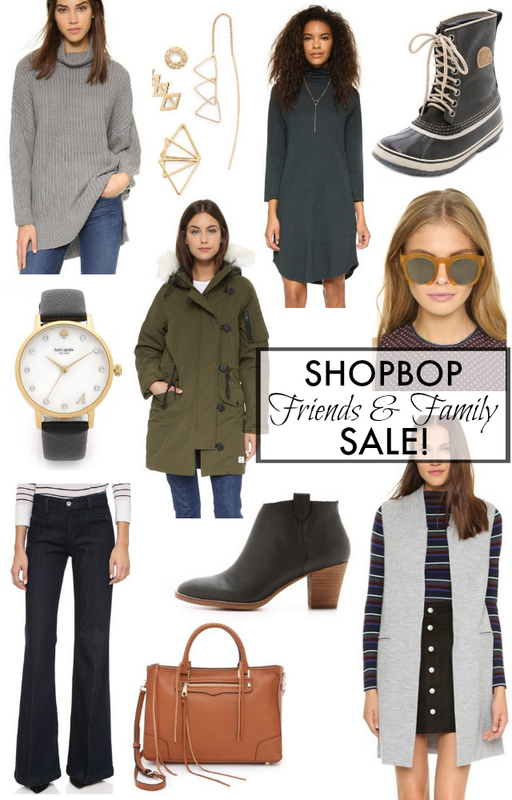 Tell me - what are you getting/wanting from the Shopbop sale?